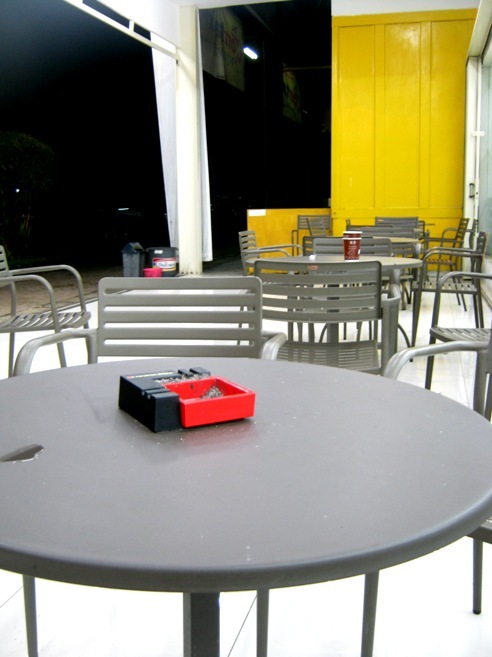 Those empty chairs located in the front of a 24-hour store at Sentul Rest Area (Bogor, West Java, Indonesia). During our car ride home from a friend's home, we dropped by about half an hour at this place to buy some stuff and have hot drinks. Only two of us sitting and drinking there. It's about 3.00 am - still dark and windy. Eerie atmosphere in this place at this time of the morning - in spite of the splash of sunny yellow!